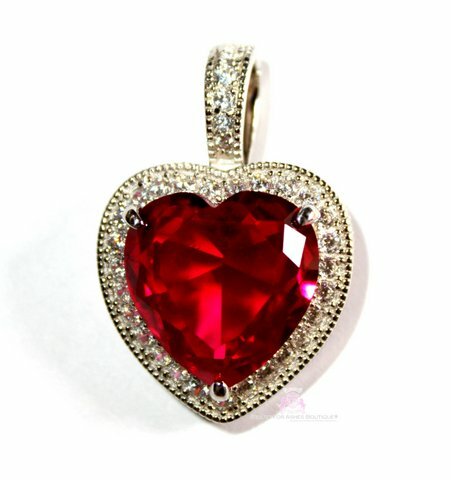 Gorgeous Pendant - called a Prophet's Heart. We begin this design with 925 Sterling Silver with a high polished white gold bonding over it for a tarnish free finish. The cz is a ruby red color, slightly rosy with faceted edges. Surrounding the heart are two layers of micro-mini cubic zirconias - This is truly a stunning piece! The clasp opens to place on any chain or our circle cz necklace for an over-the-top glamorous look! Entire pendant measures 1" across by 1 3/8" high including the bale.